Hello ... Hello ... my old friends ... It's great to see you once again! One of the rarer records sought after by ELO (and related artistes) vinyl collectors is the solid centre pressing of their third UK single, the Jeff Lynne penned classic "Showdown" b/w "In Old England Town (Instrumental)". 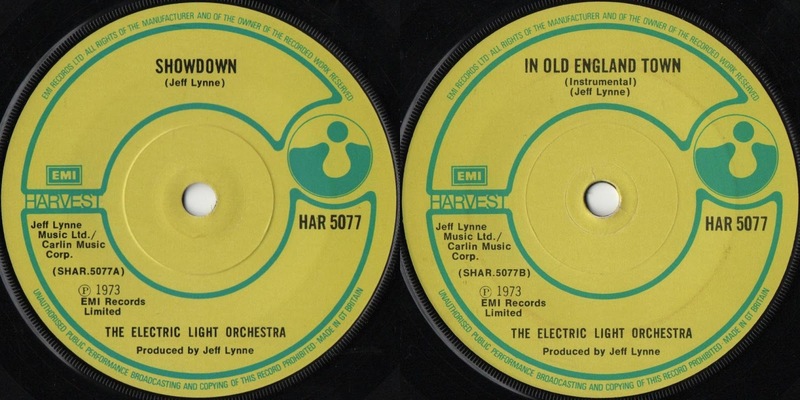 Whereas it is somewhat easy to find a solid centre version of ELO's other Harvest singles "10538 Overture" b/w "First Movement (Jumping Biz)" (HAR5053) and "Roll Over Beethoven" b/w "Manhattan Rumble (49th Street Massacre)" or "Queen Of The Hours" (HAR5063), their final original Harvest single "Showdown" (HAR5077) - which peaked at #12 in November 1973 - is much harder to track down.